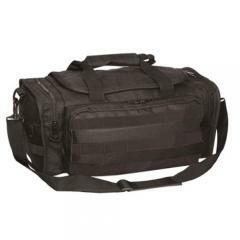 Flexibility in the field is paramount and Voodoo Tactical's Range Responder bag delivers. Durable construction combined with a variety of pockets ensure users pack and reach all essentials without sacrificing security. The roomy interior offers two padded dividers that can be manipulated to suite user preference and needs. Multiple zippered pockets provide convenient decompartmental organization of gear. Padded side pockets incorporate shell loops for secure retention of range accessories. Exterior loops accommodate a secure hold of flashlights, batons and other everyday carry items. The Range Responder offers comfortable and convenient carry with its wrap-around handle, or adjustable shoulder strap equipped with a non-slip shoulder pad.